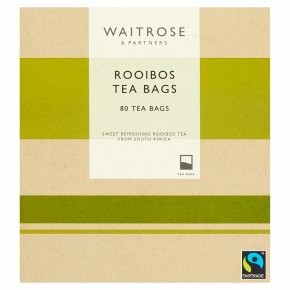 Small leaf Rooibos, specially selected and blended for Waitrose. Naturally caffeine free refreshing South African Rooibos, hand-picked from the Western Cape of South Africa, gives a bright red colour and a distinctively sweet flavour that can be enjoyed any time of the day. On the side of the pack. INSTRUCTIONS FOR USE. Use one teabag per person. Use only freshly drawn water, do not reboil. Pour water onto the teabag as soon as it boils. Stir immediately. Leave for 3 - 5 minutes, depending upon preferred strength. Add milk or honey, if desired.